Read here how to post costs and working hours in InLoox PM 7. The system assigns the effort to the project plan automatically and stores a separate cost record. 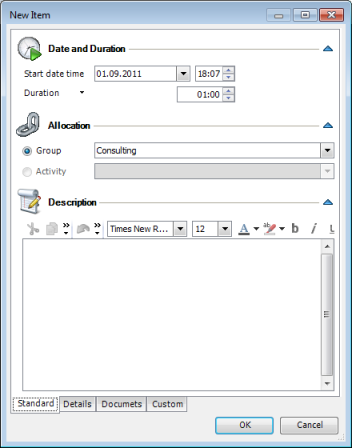 In the Allocation area select the Group or Activity / Milestone option from the planning, to which this item belongs. On this tab, click Add to add a new document. Now, you can see the added document on the time tracking list marked with a paper clip . Click this symbol to open the document. This document is also saved on the Documents page. How to create and edit a time tracking entry in InLoox PM 7 • Copyright 1999-2019 © InLoox, Inc. All rights reserved.